FILE - An Afghan soldier at a checkpoint near Pul e Khumri, 107 kilometers south of Kunduz, Afghanistan, which was attacked by Taliban forces earlier this month. An anticipated annual winter reduction in fighting in Afghanistan has prompted international and regional partners to intensify efforts to encourage a revival of Afghan peace talks. This year's fighting season witnessed a sharp increase in Taliban-led insurgent advances across Afghanistan since the Islamist group was ousted from power in late 2001. The battlefield setbacks are not surprising to many, as Afghan security forces took on the insurgency for the first time without any direct international military assistance after NATO ended its combat mission last year. However, at a time of dwindling foreign financial assistance, questions are being raised about the sustainability of the Afghan military campaign in the years to come. These concerns have prompted key partners such as the United Nations, the United States and China to push the warring sides to return to peace talks. On Friday, Nicholas Haysom, chief of United Nations Assistance Mission in Afghanistan (UNAMA), visited Islamabad and met with top Pakistani officials to discuss the peace efforts. Earlier this week, China's special envoy for Afghanistan and Pakistan, Deng Xijun, visited both countries to underscore the need for resuming peace talks between the Afghan government and the Taliban. He spoke to local media in Islamabad. “We think that the Taliban is one of the main forces of Afghanistan in the political arena and we think that the peace talks is the only way out for Afghanistan to achieve lasting peace and stability,” he said. The Chinese envoy cautioned the peace process is fraught with many problems and challenges. 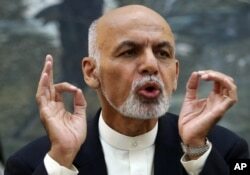 He also offered to facilitate the Afghan dialogue, provided all stakeholders agreed. Xijun reiterated that a peaceful Afghanistan will ensure stability in China’s restive border region of Xinjiang and allow enhanced Chinese economic investment in Afghan reconstruction projects. Speaking in Kabul on Wednesday, the U.S. commander of the NATO-led Resolute Support mission in Afghanistan, General John Campbell, called for coordinated regional efforts for ending the violence. He acknowledged that continued insurgent attacks and reports of divisions among the Taliban could pose challenges. “I think Pakistan, I think Afghanistan, I think China, I think the United States, I think many countries can continue to encourage them (the Taliban) to come to the peace table and if they are divided it will be a little bit tougher and may take a little bit longer. But again, I think reconciliation, I think the peace process is where this has to end up at some point in time,” said Campbell. In his bid to end violence in Afghanistan, President Ashraf Ghani set aside past differences with Pakistan and requested it use its influence with the Taliban to help in facilitate peace talks with the insurgent group. The move led to the groundbreaking face-to-face talks between the Afghan government and Taliban officials in July, the first such interaction in 14 years. Ghani, however, was criticized by political opponents and members within his own national unity government, blaming Pakistan for Afghan's instability. General Campbell defended Ghani’s peace moves. “So, here he is trying to reach out to drive them (the Taliban) to the peace process and he is being very careful about it and people are criticizing him on that, which did not help matters at all. Again, all it did, it helped the Taliban, it did not help the national unity government,” said Campbell. The Pakistan-backed Afghan peace process was halted just days after the preliminary first round when it was revealed that longtime Taliban leader Mullah Omar had died two years ago. Taliban insurgents have since intensified their hostilities and had briefly overrun the key northern city of Kunduz in late September. FILE - Afghan police officers march during a graduation ceremony at a national police training center in Jalalabad, east of Kabul, Afghanistan. A splinter faction opposed to Omar’s successor, Mullah Akthar Mansoor, has recently appointed its own leader, Mullah Rasool Akhund, to lead the dissidents. But Manoor’s faction has downplayed the division, saying the Taliban is intact. The recent spike in violent attacks has added public pressure on Afghan leaders to keep Pakistan from any future peace and reconciliation efforts. There are also growing Afghan allegations that Pakistan has not cut covert ties to the Taliban, charges Islamabad denies. Former Afghan Interior Minister Umar Daudzai insists that instead of relying on another country’s mediation, Afghans, with the help of the United Nations, can find a solution to the conflict. “That mediation role should be given to Afghans or Afghans should take that mediation role because there is a traditional jirga mechanism in the Afghan culture where there is a conflict then few reputed impartial elders come forward and declare themselves as mediators between the Taliban and the government,” said Daudzai. FILE - Afghanistan's President Ashraf Ghani talks during a press conference at presidential palace in Kabul, Afghanistan, Oct. 1, 2015. Despite the growing Afghan opposition to Pakistan’s role in the peace process, officials in Islamabad, requesting anonymity, tell VOA that behind the scene efforts are underway to push the Taliban to cease their violent campaign and return to the peace table. In the face of widespread domestic opposition, Afghan diplomatic sources say Kabul is awaiting concrete counter-insurgency steps from Islamabad to enable President Ghani to attend a key summit on Afghanistan to be hosted by Pakistan next month. The meeting of the so-called "Heart of Asia-Istanbul Process" was launched in 2011 to bring together regional countries to promote peace and prosperity in the war-torn nation. The Taliban, however, has criticized Ghani’s government as a “multi-headed” administration devoid of any specific policy on peace. 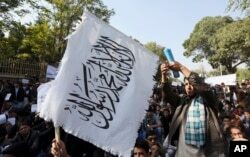 “We want peace, which is good for our people and the country,” the Islamist group said in a statement. It also reiterated that the complete withdrawal of foreign forces and the establishment of “an Islamic government” are essential for peace in Afghanistan.